What's On My Android - Super Clock Widget and Missed It! ~ Android Forever! 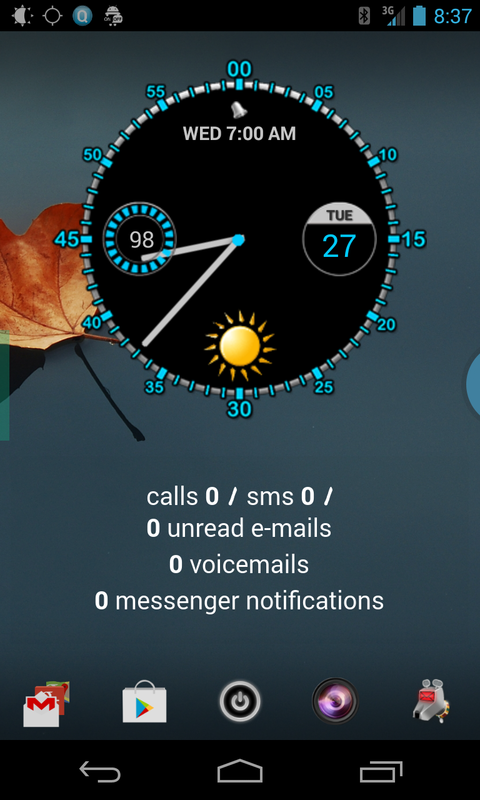 What's On My Android - Super Clock Widget and Missed It! I always, or almost always, love my Android home screen setup, but the last few days have been especially good to me with some great widgets I've found. I want to share them with you, my wonderful and dear readers. The one on top is called Super Clock Widget, and comes in a free or paid version. Developer Quote: "We call it, Super Clock! You get all useful information here. Clock, Calendar, Battery Meter, Weather information, Timezone and even Alarm Clock. All on a single widget. It is lightweight (both apk size and data traffic), efficient and effective widget, functional yet attractive widget." The one underneath is a great-looking, inexpensive widget called Missed It! that shows at a glance your missed calls, texts, emails, and more. Developer Quote: "Get information about the number of missed calls, unread SMS, unread e-mail messages and notifications from virtually any application a glance with this simple yet very customizable widget."